A wealth of conspiracy theories have followed the sudden and shocking death of 79-year-old Supreme Court Justice Antonin Scalia, with many people suspicious of the circumstances surrounding the jurist’s demise. But Scalia’s own son is now pleading for an end to the “hurtful” speculation. Appearing on the Laura Ingraham radio show, the conservative giant’s eldest son, Eugene Scalia, denied there was any wrongdoing in his father’s death. “It’s, I think, a distraction from a great man and his legacy at a time when there’s so much to be said about that and to help people even more fully appreciate that. And, on a personal level, I think it’s a bit of a hurtful distraction for a family that’s mourning,” the Scalia scion said. “But they say they found a pillow on his face, which is a pretty unusual place to find a pillow… I can’t tell you — I can’t give you an answer,” Trump said on the Michael Savage radio show on February 16. Trump appears to have misconstrued an early report of comments made by the owner of the Texas ranch where the judge was staying during his vacation trip. “The pillow was against the headboard and over his head when he was discovered. He looked like someone who had had a restful night’s sleep. There was no evidence of anything else,” the ranch owner concluded. Trump and radio talker Savage aren’t alone in promulgating conspiracy theories about Scalia’s death. Since his sudden passing last weekend, any manner of wild claims about the jurist’s demise has made the rounds on the Internet. But Eugene Scalia says there is nothing to the claims. “Our family just has no doubt he died of natural causes. And we accept that. We’re praying for him. 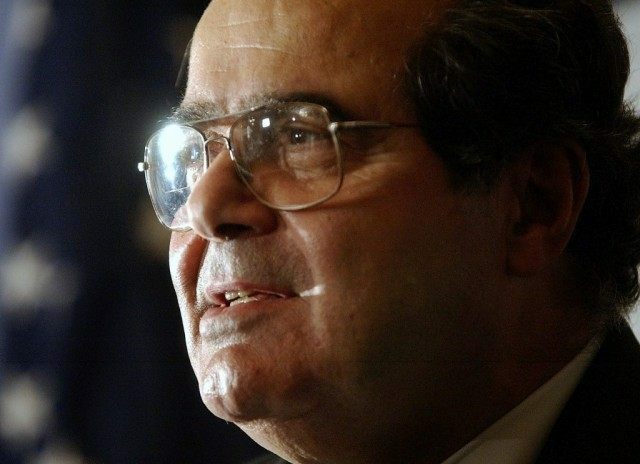 We ask others to accept that and pray for him,” the Scalia heir insisted.